Have you ever wanted to create the most amazing bathroom with unique features that will thoroughly impress your guests? Well I certainly have. Everyday our suppliers are coming up with the newest top of the line features for your bathrooms. Plumbtile is the first to always make sure that we give our customers the newest products on the market. Graff’s Ametis Ring shower head is mounted right on the wall and comes finished in powder-coated, high quality steel. It is available in a few different finishes such as architectural black, white, or polished chrome, the sculptural circle features six full-colour spectrum LEDs, creating a spa-like chromotherapy glow. The shower head releases a halo of water; you can choose to either transport yourself to a relaxing waterfall or rain-jet setting. It is truly stunning. You can also add the Xtend Bathtub to your modern bathroom design. The Xtend bathtub is a pop up tub. This model was designed during a competition and is part of German brand Kaldewei’s . 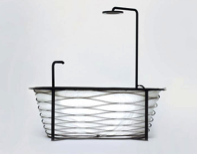 It is the most unique and beautifully designed bathtub that uses carbon fiber to enable it to be collapsible, arriving as a portable flat package before expanding into a classic tub-shape in its wire structure. Inside, there is soft padded material for a comfortable bathing experience, be it indoors at the office, or camping outside. Can you imagine the look on your friends faces when they see this in your bathroom? Last but not certainly least Duravit has introduced a new furniture range for its basin units, conceived by Sieger Design. They listened to their clients cries for more space on their vanity. And who couldn’t use more space Answering the demand for ever more vanity space, the German manufacturer has produced a variety of wall-mounted and floor standing cabinets that maximise storage yet maintain a discreet look. The seamless edges and subtle new die-cast zinct feet neatly complement the brand’s basins. We’re smitten with the soft curves and textured linen finish of this ‘Happy D.2’ Unit.